Organized soccer is alive and well in the Pioneer Valley for young people of all ages. Michael Harrison talks with Ludlow High School boys varsity coach Greg Kolodziey who also serves as GM of the Pioneers. Easthampton Mayor will hire a private investigator over allegations of a hostile workplace. Southwick Country Club to be auctioned – everything has to go! Chicopee raises the age of legal tobacco sales! Six school threats and two arrests in a couple of weeks. Joe Lieberman talks with Pioneer Valley Radio’s Michael Harrison. West Springfield Police and the Mayor say a heartfelt goodbye to K9 officer Donn. Century Plaza welcomes the new Skechers! Agreement between Hampden and Wilbraham ensures Hampden students go to their hometown school until high school. Suppose you were invited to a dinner at a posh golf club in Florida, and purely on the impromptu, in walks the most powerful man in the free world. You are now rubbing elbows with President Donald Trump, as the two of you gather your steak and lobster from the buffet. What is your conversation like? Michael Harrison, in a conversation with Brad Shepard, now brings this encounter to life in vivid detail! Enjoy a holiday fireside chat as the sounds of the season, past and present, are explored! The artists, old and new. The styles. Carols vs. songs. Hearing the music literally everywhere….a good thing? Happy holidays from Michael and Brad! There are a lot of exciting things happening at ELCAT. Located on the premises of East Longmeadow High School, it serves the community, chronicles the town government, provides a platform for residents and gives local students a tremendously valuable educational opportunity. It was a scene out of “Friday Night Lights” as hyper-local Pioneer Valley Radio (www.PioneerValleyRadio.com), serving Springfield and its surrounding communities in Western Massachusetts, launched its new sports department with live play-by-play coverage of high school football games. Pictured in the press box calling the PBP between the home team Longmeadow High School “Lancers” and visiting Chicopee Comprehensive High School “Colts” is Pioneer Valley Radio sports director Kevin Casey (c) joined by color callers Eddie Garibian (l), a Longmeadow senior, and Graham Topor (r), a Chicopee Comp junior. Pioneer Valley Radio was launched in 2015 by local resident Michael Harrison and former WHYN, Springfield morning personality Brad Shepard as an experiment in local “personality-oriented, hyper-local public affairs radio.” Since then it has gained tremendous traction and become what Shepard describes as “an important local media platform that is making a difference.” The expressly non-partisan station has expanded its menu to include a wide variety of programs covering local politics, civics, business, education, public health and safety, arts and entertainment and now, sports. According to Casey, “One of the most satisfying aspects of this project is giving local high school students the opportunity to sit in the broadcast press box and call color on the radio. These two great kids, Eddie and Graham, were fantastic! We plan to expand our coverage beyond football to include basketball and other sports and get lots of kids from area schools involved in our broadcasts.” The next scheduled football game to be covered is the annual Thanksgiving classic between Longmeadow and East Longmeadow on Thanksgiving morning. All Pioneer Valley Radio live broadcasts are powered by Boston-based Backbone Networks. Schools interested in having their games broadcast and businesses interested in sponsoring these broadcasts should contact Michael Harrison at michael@talkers.com. Michael Harrison’s award-winning international podcast “Up Close and Far Out” serves as the platform for a fascinating conversation with PVR’s Brad Shepard about the legendary TV kiddie shows and hosts of the late ‘40s through early ‘70s. Not to be missed! Click here or below to see this and other episodes of “Up Close and Far Out with Michael Harrison. An in-depth discussion about one of America’s greatest entertainment icons. “Hail fellow, well met,” are the perfect words to describe Anthony Cignoli, a man located at the heart and nerve center of Western Mass., state and national politics. Tony dropped by to say “hello” to Michael and Brad at the Cocchi Picnic. In this thorough, energetic, and unedited conversation, you will hear Tony at his best on the subject of Springfield, Holyoke, the region’s players, high speed rail, the economy, real estate, and other hot topics! Western Mass. resident and Pioneer Valley Radio personality Michael Harrison paid a visit to the nearby Vintage Radio and Communication Museum of Connecticut in Windsor where he interviewed the institution’s Founder and Executive Director, John Ellsworth. Harrison describes the museum as a “regional treasure” that should be visited by residents of the Springfield area interested in the colorful history of radio, TV, and electronic media. 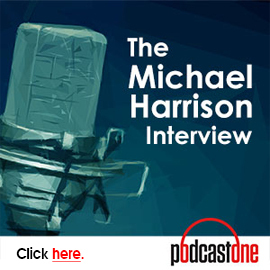 This interview appears on Harrison’s locally-produced, award-winning international podcast “Up Close and Far Out with Michael Harrison.” Don’t miss this!